American Classic hubs are made in USA, using a one piece aluminum hub shell construction. The front hub is turned on a lathe from aluminum rod stock. It's drilled through, then bored from each end to make a recessed cavity for the precision sealed bearing cartridge used in each side. Once the bearings have been pressed in place, a hollow aluminum axle machined from rod is pressed through the length of the hub and bearings. The axle has 12mm outer diameter and a 6.35mm inner diameter. It's important to note, because this hub uses precision sealed bearings, all the weight on the hubs is vertical and using an aluminum axle is an acceptable way to reduce weight without compromising the integrity of the hub. A groove is cut around the axle 2mm from each end seats a small rubber O-ring. The O-ring stands a little taller than the axle surface and is used as a compression retainer for an axle cap. 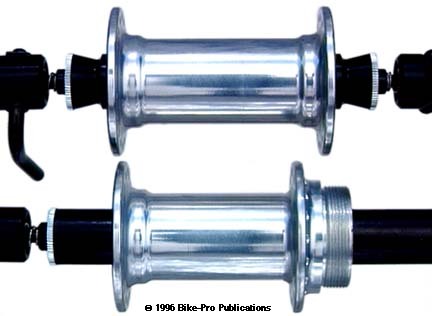 The front hub uses two machined aluminum axle caps. Each of these caps slides over the axle, and is held in place by the O-ring. A 9.3mm O.D. steel contact washer is pressed onto the cap, over the reduced 9mm diameter end that fits in the fork. The rear hub is manufactured in the same way as the front. However, it has threaded drive side for an English threaded freewheel to thread on. The American Classic rear hub comes with three axle caps. The caps will fit on either end of the axle. Used in particular combinations they will properly space and build the axle to accommodate a 126mm 6 or 7 speed Road use, 130mm 8 speed Road / 6 speed Mountain use, or 135mm 7 or 8 speed Mountain use. The rear is sold to beciome either a 126/130mm or a 130/135mm. These caps like those on the front axle, add further support to the axle, and have a 9.3mm steel contact washer pressed onto the 10mm diameter protrusion that fits into the drop-out. 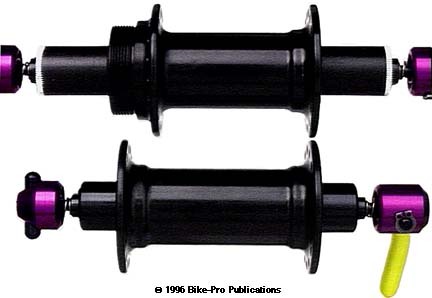 These hubs come with a pair of American Classic steel skewers which are described toward the end of this article. The front hub has a 50.5mm hub flange diameter, with the hub flanges 69mm spaced apart. The front spoke holes have a 43.5mm center circle diameter. The rear hub has a 50.7mm hub flange diameter, with flanges spaced 57.5mm apart. The rear spoke holes have a 43mm center circle diameter. With steel skewer, the front weighs 203.5 grams, (skewer is 56 grams), the rear with skewer, and without cogs, weighs 240 grams, (skewer 60 grams). The America Classic hubs are hard anodized in six colors, Blue, Black, Gold, Lavender, Red or Silver. The lever cap and adjusting nut of the skewer are anodized to match the hub color. The skewer lever is always Black. The hubs are available in 28, 32 or 36 hole drilling, matched front & rear the way you want. Please specify hole pattern.